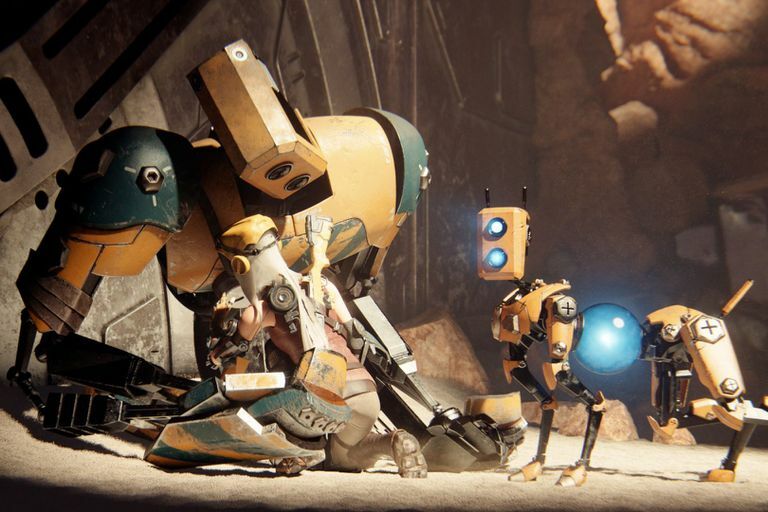 Have you been enjoying ReCore, the latest game from Keiji Inafune's Comcept? You've probably got a lot of questions. And that's fine, that's what we're here for, to make sure they get answered. ReCore finds you taking up the mantle of Joule, a young woman who finds herself the final survivor of a planet that was meant to be colonized for humans, except nearly every single thing that could go wrong did... in an extremely bad way. But Joule isn't alone on this terrifying new planet. She's got a robot sidekick as she faces off against the other robots that now inhabit the world. So don't worry. Even though it might feel like it's you against the world, that couldn't be further from the truth. This beginner's guide to ReCore will make ensure you know exactly what you need to do to get through the game to the end, even if you think the odds are stacked against you. From pulling off Extractions to color coding your attacks, you shouldn't want for help after poring over what we've got in store here for you. ReCore is an action-based shooter, where Joule has several different abilities. She can jump, dash, charge her weapon up to fire deadly ammo, lock onto enemies, and use the "action button" to accomplish various actions. While all of these are pretty simple maneuvers for the game, you'll want to make use of a very special ability: Joule's Extractions, which essentially means she can remove the cores from enemies. If you decide not to destroy an enemy completely, you'll have to engage in a quick battle to wrestle it from an enemy's body before it collapses. You have a special button to accomplish this with, so hold down the button assigned to your Extractor tool to engage in the mini-game. Alternate between pushing and pulling to finally yank the core from its owner, and you'll find yourself with a core to use for extra stores of materials. One will occur when you finally drain a robot's health bar, and one will happen when you get your combo meter above 10. You won't have to mess with the special mini-game if you can get here because the core will instantly be extracted. Your combo will end at the same time, but you'll get a glut of experience points for the trouble. On one hand, it's a good idea to expend more energy to get the cores, but you might also waste energy you could have better spent exploring and making sure you get every single item you need to progress further in-game. You really have to spend some time making these decisions if you're going to get the most out of ReCore. It's got this hidden layer of strategy that you'll want to pay attention to if you want to do well. You'll need to use various frames throughout the game, especially for your FL1-R frame. Consider utilizing Seth to increase your damage going forward and use colored Cores to augment him going forward. You could use Purple Cores to get Blue and Red Core energy, Green Cores to get Yellow and Blue Core energy, and Orange Cores to get Yellow and Red Core energy. Make sure you collect as many various Cores as possible so you can upgrade later on. You'll be thankful for it when you start encountering various types of enemies that require different methods to take them down. Make sure you're utilizing special workbenches when you get to them. You'll need to use it to put the resources you've had to good use. Any resources you gather can go with you directly back to the crawler, and they'll be delivered there as soon as you enter. Your workbench can be used for you to create special items. Of course, you'll need a series of blueprints to complete the construction of various items going forward. To put the blueprints together, however, you'll need special resources and materials. Resources can be found in three varying levels of rarity: base cores with lower power, high quality with larger shell parts, and flawless cores with extra power to spare, so you can use them with larger shells. It's best to save these up as much as you can because they're not easy to come by. Obviously, a larger game will yield you better results, so keep that in mind as well. Like many of the other systems in ReCore, gathering and keeping resources around is all about good management and little else. If you keep things compartmentalized the way they should be then you'll be fine. Speaking of strategically attacking enemies, take note of each monster you come across. It will have a different core, so make sure you notice what color it is before launching a coordinated attack offensive. As you make progress through the game you'll find you get upgrades for Joule's rifle that coordinate with the colors you see out there. If you see a red orb, make sure you use weapons and abilities that correspond to red orbs and correlate the same attack patterns with the rest of the enemies throughout the game. If you've played games like Ikaruga before, this will probably make sense since much of that game is spent "changing polarities" between black and white colors. White will absorb white and black will absorb white. It's a similar situation here except the same color as the enemies come across means you'll get more damage in. It may not make much sense if you're used to games like Pokemon or Magic: The Gathering, but there's a system in place here for a reason. You may not be aware of it, but you have to collect various sources of energy called Prismatic Cores throughout the game in order to access various parts of it. If you don't, you actually won't be able to complete the game. You need 45 Prismatic Cores to finish the game's campaign in its entirety, so make sure you get everything you need as you go through the game. This means taking some time exploring segments of every dungeon and various section you can even if you're more compelled to just fly through it. In fact, to get additional Corebots, you'll need to finish story missions. If you get to the final dungeon and you haven't already explored everything, you won't get a chance to go back, so make sure you've gotten it all out of your system. Get the Hang (Swing?) of Things! ReCore is a platformer at heart, so make sure you have some sort of idea of what you're up against before jumping in without any real idea of how to play. Joule can flip and twist and jump through the air with the greatest of ease, and her exo-suit lets her make two jumps in the air. She can also pull off an aerial dash. Once she hits the ground, her jump is reset and she can spring into action once more. She's at her best when she's airborne, and there's even an indicator while you're in the air to show you where you're going to land. This is important since you'll often be made to take leaps of faith that may not work out well otherwise. There's a lot of planning to be had with some of these platforming segments, so knowing a little bit about what Joule has to offer by way of acrobatics is important. This might seem like silly advice or some that you don't really need to heed because it's obvious, but make sure you spend enough time grinding for XP whenever you can. ReCore combines multiple elements of several different genres, including RPGs, so you'll have to pay very close attention to how you're "raising" Joule in-game. Don't waste time escaping battles or anything of that ilk because you won't get all the XP you need to continue. Joule will absolutely need to be leveled up, in fact, for you to access certain parts of the game as well. It might be tempting to hurry as fast as you can to the next checkpoint, but if you can't proceed there's no reason to do so. You'll just be left waiting until you can grind enough to go ahead. These beginner's tips should set you on your way to becoming a veritable ReCore master. Now that the game's available via Microsoft's Play Anywhere initiative, you can play on either Windows 10 PC or Xbox One and take the game on the road so if your friends happen to need help, you can let them know what's up. What Is Address Resolution And How Can You View The ARP Cache? Do You Know How to Download Torrents?